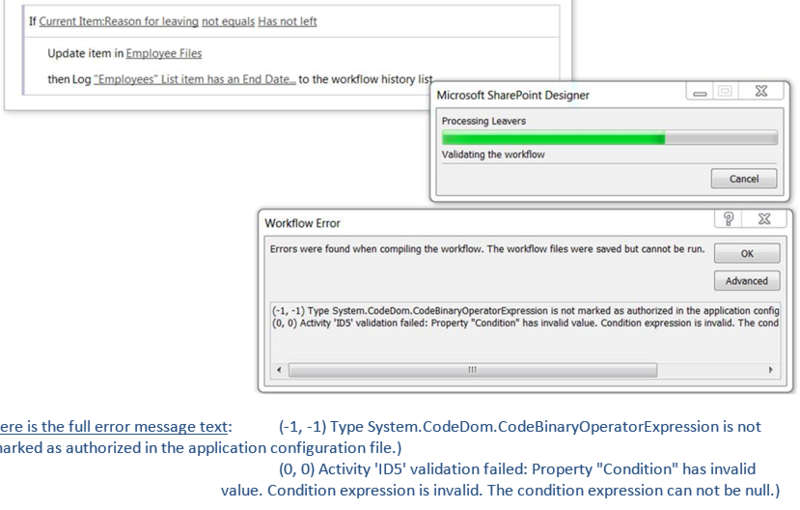 I am using SharePoint 2013 farm if I try to publish Workflow for Document library getting below error. if I check for errors before publishing, there were no errors. I've had this too, it started yesterday I think. This Microsoft link fixed it for me. The ​problem was caused by a .Net update. If only these things were tested before they were released! Below is my workflow error message - all workflows had stopped working in the Sharepoint Farm. I was told that the MS fix in the above link, running IISRESET and also a WakeUp script fixed it. As a solution for this problem, follow the instructions in this MS Article by adding the code referenced to the web.config file on your SP server. In my organization's case, this was applied only to web front end servers but check with your IT team to verify that against the topology of your farm. Microsoft released a .NET update which causes lots of problems with SharePoint workflows. Simply download the script on one SharePoint-Server and execute it in SharePoint PowerShell. The changes are automatically propagated within the entire farm (if you have mulitple servers). Important: This script causes an IIS-Reset on every server. So SharePoint will not be available for some minutes. I started seeing the same thing this morning. I am not a Farm Admin -- but, I understand from the link that the PowerShell Script, at the bottom of the ref'd link, needs to be run on one of the Farm WFEs. They say that that should resolve it. If a column has changed in SharePoint while Designer was opened, Designer may need a quick refresh. This can be achieved by either restarting Designer, or by clicking the data refresh icon at the top left corner of the window. Surprisingly, this fixes certain errors to do with designer workflow activities. I can see it as answered but just wanted to share few links for others who turn up like me who have faced the same issue. Not the answer you're looking for? Browse other questions tagged sharepoint-designer sharepoint-server workflow or ask your own question.